The cast on the set of A.E.S. Hudson Street. A.E.S. 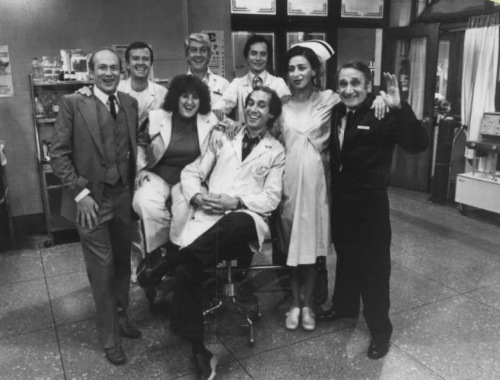 Hudson Street was an American sitcom that aired from on ABC from March 23, 1978, through April 20, 1978. The plot revolves around Dr. Antonio ”Tony” Menzies (Gregory Sierra) who is the chief resident of a run-down, ill-equipped, and underfunded hospital in the inner-city area of New York City. Five episodes were made, but all received mixed reception upon its airing. It did not help that the show aired at a later time and suffered from lower viewership as a result. To this day, only a promotional clip for A.E.S. Hudson Street has surfaced. A.E.S. Hudson Street centers around the staff and patients at an underfunded and overcrowded emergency ward in New York City. Dr. Tony Menzies (Gregory Sierra) is the chief resident of the hospital which offers "adult emergency services". Having to deal with various patients often in a comedic tone, he aspires to be somewhere else in his medical career. Dr. Tony Menzies is often at odds with the hospital administrator J. Powell Karbo (Stefan Gierasch) as he will not promote Dr. Menzies. A promotional clip from ABC that features A.E.S. Hudson Street. IMDB page for A.E.S. Hudson Street.